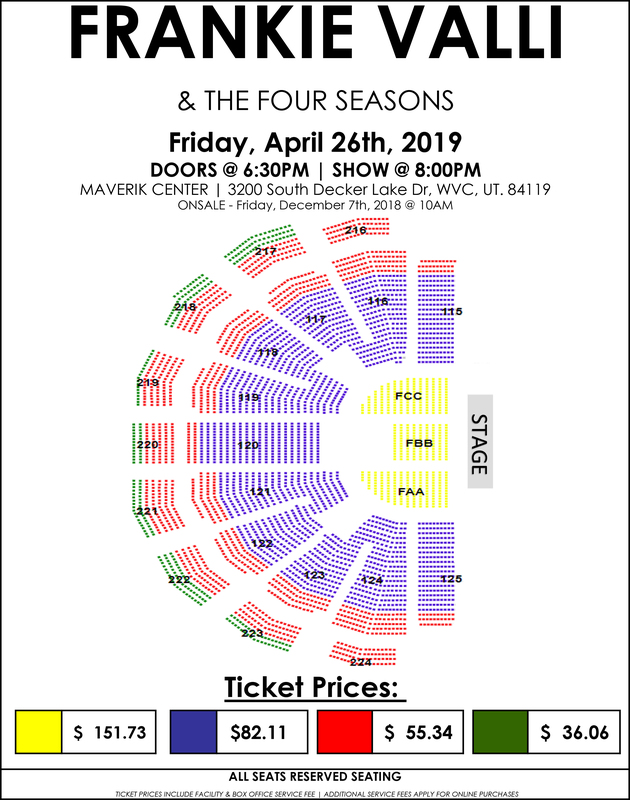 Danny Zelisko Presents proudly welcomes legendary music icon Frankie Valli and the Four Seasons to Maverik Center on Friday, April 26, 2019 at 8:00 p.m.
Frankie Valli, who came to fame in 1962 as the lead singer of The Four Seasons, is hotter than ever. Thanks to the volcanic success of the Tony-winning musical Jersey Boys, which chronicles the life and times of Valli and his legendary group, such classic songs as “Big Girls Don’t Cry,” “Walk Like a Man,” “Rag Doll,” and “Can’t Take My Eyes Off You” are all the rage again. The widely acclaimed musical has touring companies around the world, as well as a version at Paris Las Vegas. The Four Seasons (group members 1960–1966) were inducted into the Rock and Roll Hall of Fame in 1990, and joined the Vocal Group Hall of Fame in 1999. With 71 chart hits (including forty in the Top 40, nineteen in the Top 10 and eight No. 1’s), they are one of the best-selling musical groups of all time, having sold an estimated 170 million records worldwide. Valli is the only member of the group from its inception who currently tours.